Published: Nov. 29, 2012 at 10:17 p.m. Updated: Nov. 30, 2012 at 02:51 a.m.
Drew Brees is known for his smarts on the football field, but a series of ugly mental mistakes at the end of the first half left some New Orleans Saints points off the board Thursday night against the Atlanta Falcons. Mistake No. 1. An unnecessary offensive pass interference penalty by tight end Jimmy Graham erased a Saints touchdown after Darren Spoles appeared to cut the Falcons' lead to 17-14. Still, there were 45 seconds left as the Saints lined up on first-and-goal from the 17-yard line with no timeouts. That should have been plenty of time. 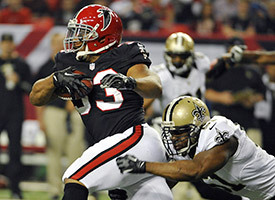 Check out the best photos from Week 13's matchup between the Saints and Falcons. Mistake No. 2: Brees connected on a dump-off pass to Sproles for 12 yards on the next play, leaving the ball at the Falcons' 5. Great. But the Saints oddly took their time setting up for the next play, wasting precious seconds before their second-down snap. The next play wasn't snapped until 12 seconds were left on the clock. Mistake No. 3: At that point, Brees' next pass had to go into the end zone or to the sideline. He threw the ball short to Sproles over the middle again. Sproles was tackled at the 2, and Brees didn't have time to get off the next play. It was a stunning display during a half that Brees would like to forget. He was intercepted twice. The reason he didn't have any timeouts late: He wasted one of them to avoid a delay-of-game penalty earlier in the half. These are the kind of mistakes you expect out of a rookie quarterback. They might have wound up costing the Saints a chance to win a game they desperately needed, which ultimately was a 23-13 loss in the Georgia Dome.